I am making some cards for my mom to give and I figured I might as well play some sketches at the same time! This one is for Sketch Challenge #19 by Waltzing Mouse. I had so much fun making this card. I started by making the flower using my new Heartfelt Creations 5 petal flower dies and Bittersweet paper. I embossed each petal from the back of the paper with a traditional embossing tool. Then I embossed the middle of each flower from the front to cup the petals upward. Next I scrunched them so they wouldn’t look so perfect and inked the edges with Antique Linen distress ink. Then I punched holes in the middle of all the petals and threaded the stamens through the middle. After adhering it to the card, I added slivers of foam dimensionals under the larger petals to get more dimension. I made the leaves by folding green ombre ribbon into leaf shapes holding them in place with Scor-Tape. The large flourish is embossed with pale pink powder. To make it pop, I darkened the pattern in the background DP with medium brown ink. I sure hope the Waltzing Mouse Design Team likes my card! 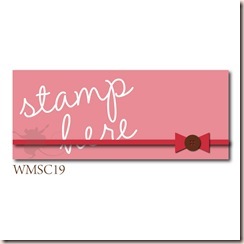 Here is the tag I created to go with it. I had intended to make this card using the last sketch I did and had set up the Just Rite Stamps so even though they didn’t work with this sketch and the flower I made, I decided to still use it by making this tag. Hi rebecca 🙂 wow!! this is just beautiful. I love these color combos! Beautiful! Love your colour choices and the flourishin pink is fabulous! Stunning project, love the colors! Thanks for joining us this week at the WMSC! This card is SO fabulous. I love every detail. I'll have to check out that flower die. Really really great…the tag, too! So many lovely things on this Rebecca! 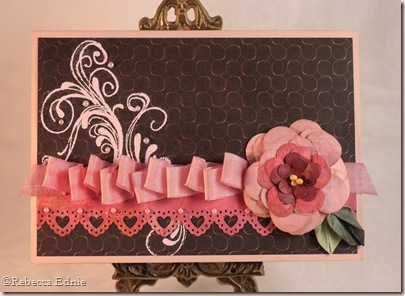 love the colors, the pleated ribbon and lovely flower – and what a great tag to go with it! thanks for playing with WMS this week!